To create relationship roles open the System Configuration tab and select Contact/Company Relationship Roles from the left hand menu. Select ‘Add New Relationship Role’ and add the name of the relationship that you wish to be added to Sentle. NOTE: DELETING A RELATIONSHIP ROLE WILL REMOVE THOSE LINKED RELATIONSHIPS WITHIN YOUR CLIENT AND COMPANY DATA. Setting relationships follows the same method for both contacts and companies. Choose the ‘Relationships’ tab and select whether you want to link a contact or a company. Selecting either will open a search window from where either the contact or company can be chosen. You will have to choose which relationship type you wish to be assigned via the drop down menu on the search box. NOTE: YOU WILL HAVE TO HAVE SOME RELATIONSHIP TYPES SET UP TO COMPLETE THIS PROCESS. 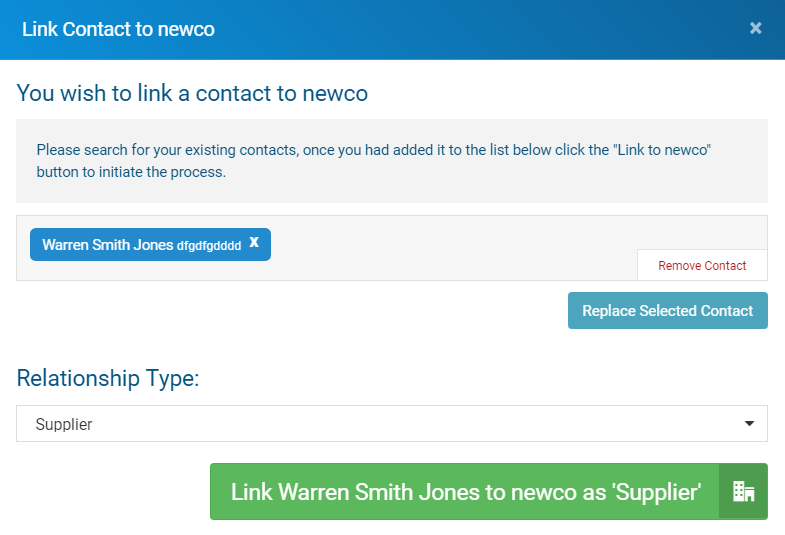 All relationships contacts or companies will be listed within this area with you able to quickly remove the relationship if required by simply clinking on the relationship icon. Removing the relationship will remove the contact or company from this view.